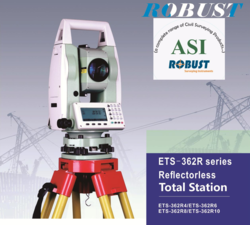 All Surveying Instruments total station , digital Theodolite, auto level and Surveying accessories with best delivery service. 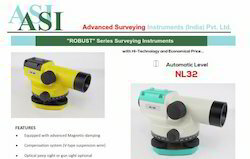 new branded surveying instruments and accessories total station , digital theodolite and auto level , prism, pole, tripod, bypod, mini prism etc. Packaging Details: Accessories with Total Station Battery Charger (01 No. ), Batteries (02 Nos.) Operation Manual (01 No. ), Tool Kit (01 No.) Carrying Case (01 No. ), Plum bob (01 No.) Pan Drive (01No.) Data Downloading Cable (01 No.) Data Downloading Software (01 No.) PRISM with HOLDER & TARGET (01 No. ), PRISM POLE (01 No.) HEAVY DUTY WOODEN/ALUMINIUM TRIPOD (01 No.) All Accessories with OEM Make Only. 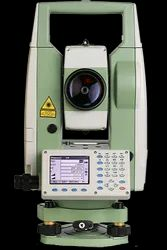 accuracy 2mm same as quality as sokkia b - 40, nikon ac-2s, topcon atb -4 , pantex ap-24, lal- 24, leica na 324 quality with easy to oprate for all surveying levelling work. 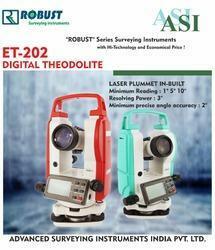 Looking for ROBUST Surveying Instruments ?